History has shown that fear, prejudice and violence develops in communities isolated by religion and politics. 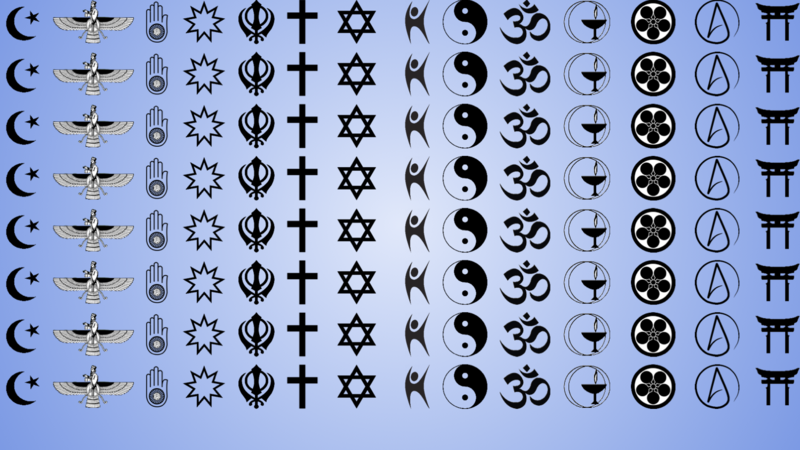 Yet our religious traditions can also contain the keys to love, empathy and peacemaking. 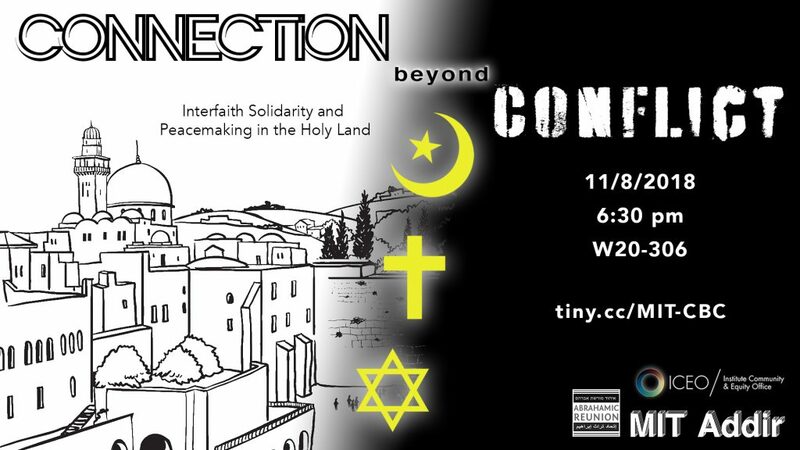 The Abrahamic Reunion is a group of spiritual and religious leaders dedicated to uplifting human consciousness and building peace in the Holy Land by opening hearts to the love and wisdom of all spiritual traditions. Click here to see some more pictures, video, and audio from the event! Inspired by the simple idea that meeting your neighbors promotes peace, Danny Goldfield set out to photograph one child from every country on earth and find them all living in his hometown, New York City. Danny told his story of going to unfamiliar neighborhoods and showing up at churches, mosques, restaurants, hair salons, any place he could find to ask for help with the project. 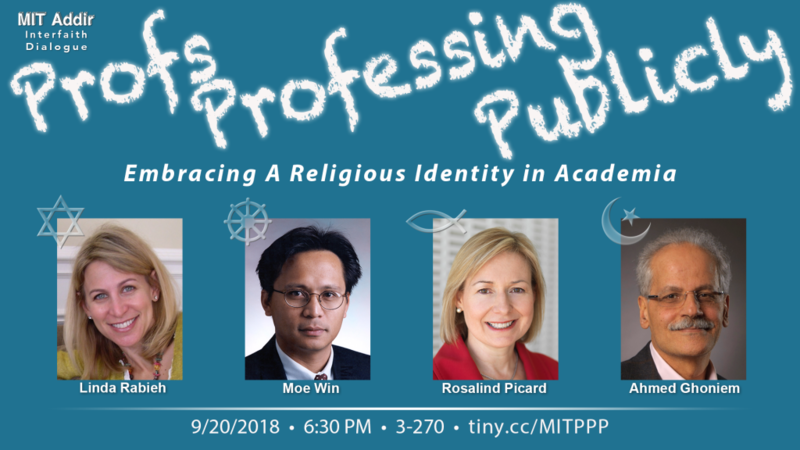 We heard from some notable MIT faculty members about how they have navigated being religious while achieving a successful career in the top levels of academia. 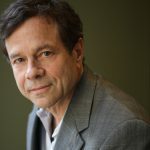 We were joined by acclaimed author and notable MIT personality Alan Lightman as he discussed his newest book Searching for Stars on an Island in Maine. Click here to see some more pictures and audio from the event! 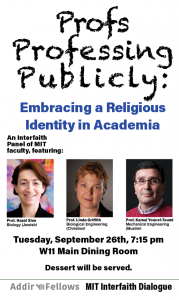 Religious tensions between Islam, Christianity and Judaism are some of the most complex, consequential and ominous challenges in today’s global community. 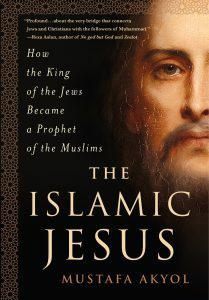 Mustafa Akyol, a prominent Turkish journalist and Muslim intellectual, offers an unexpected possibility for building bridges between the three Abrahamic faiths: the Islamic Jesus—that is Jesus as he shows up in the Qur’an. 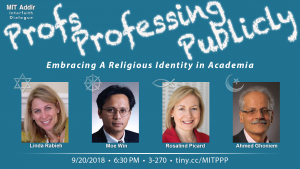 We heard about and discussed the “provocative,” “timely and important” insights from Akyol’s new book The Islamic Jesus: How the King of the Jews Became a Prophet of the Muslims. 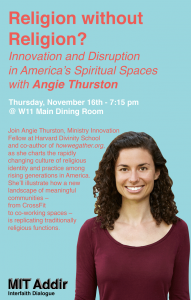 We were joined by Angie Thurston, Ministry Innovation Fellow at Harvard Divinity School and co-author of howwegather.org, as she charted the rapidly changing culture of religious identity and practice among rising generations in America. She illustrated how a new landscape of meaningful communities – from CrossFit to coworking spaces – is replicating traditionally religious functions. 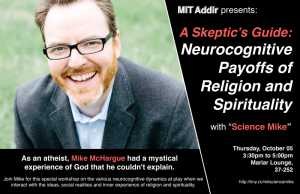 We heard from Mike McHargue, the Christian turned atheist turned mystic. Science destroyed his faith and then helped him to rebuild it in a whole new way. 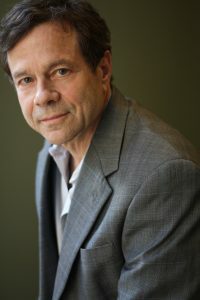 His novel approach to integrating science, religion and spirituality–which draws on insights from neuroscience and cosmology–has gathered him hundreds of thousands of podcast subscribers from all across the religious-secular spectrum.